These types of banners are also called Pop-Up Banners, Stand Up Banner Displays, Roll-Up Banners or Post-Up Banners. They are an affordable, simple solution for travel-friendly banners and displays. Retractable Banners come with a small retractable base or stand and feet that swing out at the bottom. These feet help to create a stable and supportive banner base and should be perpendicular to the stand. The banner is stored at the base of the unit. When you are ready to display your banner, you just unroll the banner from the base of the stand. There’s no fussing or tools required. Retractable Banners are designed for simplicity and ease of use. Retractable Banners are extremely easy to transport and set up. They are perfect for travel. 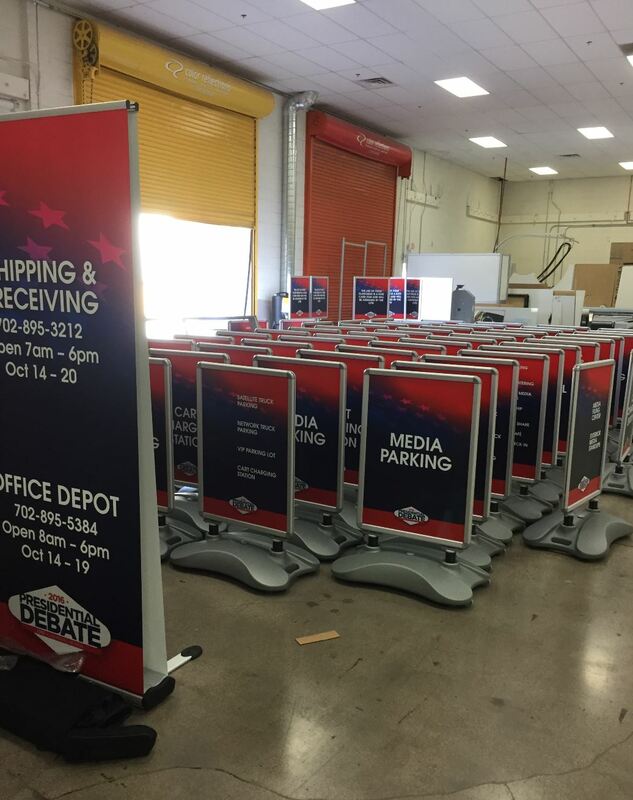 They are typically lightweight, and offer an affordable way to not only transport but change out your banners. Retractable banners are an excellent choice for taking your banners on the road with you! 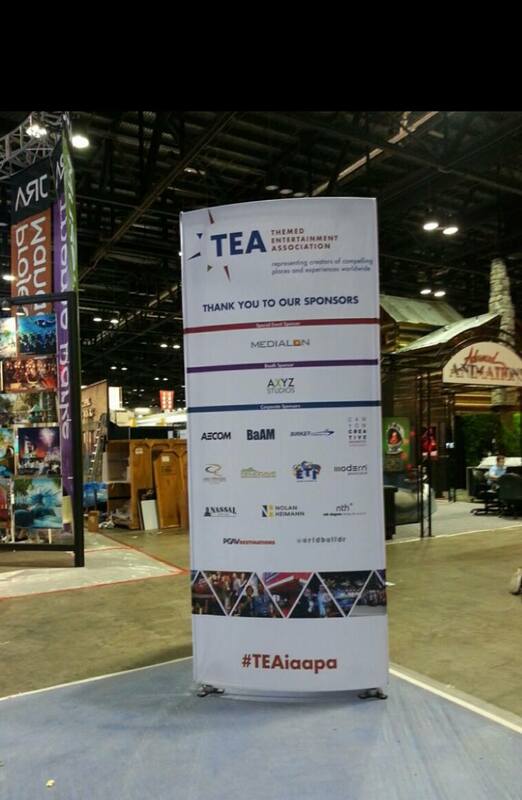 Now you can quickly bring your banners to your next trade show event, company seminar or social event. What Are The Typical Uses Of Retractable Banners? Retractable Banners are not permanent. Therefore, they can be used in a number of ways and places. Retail-based business and companies use Retractable Banners because they are a simple but effective solution for promoting sales and events. 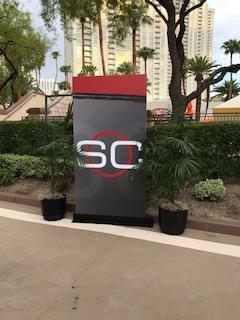 Event and production companies enjoy the ability to provide information and welcoming messages to their convention and seminar attendees. Retractable Banners are commonly used for companies and individuals who set up booths, information sessions, sign-up and giveaways, promotions or other types of events.They are perfect for businesses who are seeking the flexibility to move signs in and out of their locations as they see fit. Retractable Banners can often be seen at housing sales centers, outside retail store entrances, at social events, and at trade show conventions. Virtually any area where you are sharing a message is perfect for Retractable Banners. Retractable Banners are perfect for advertising and supporting your businesses and companies. Do you have a new product or service? Are you running a special promotion? Retractable Banners are ideal for sharing and communicating these things to your clients and customers. Let your guests know that they have arrived! Make a splash at your next event with Retractable Banners. 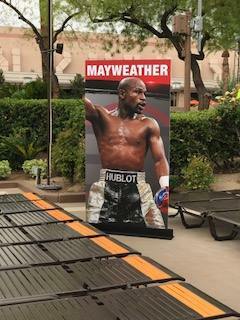 Color Reflections Las Vegas can help you create custom retractable banners for your next event. We can incorporate the theme or design direction of your event. Retractable Banners will help you business leave an impression with your event attendees. Does your business get the same questions frequently? How about your check-in process? Would your clients and customers benefit from instructional information? Retractable Banners can be used to communicate all types of information. What does your brand say about your company or business? If you are a small business, you have likely spent a lot of time and energy building your brand. Why not share this with your customers and clients. Highlighting your brand with Retractable Banners will increase customer familiarity and loyalty. Your company’s mission statement is essential. It conveys the values of your business and highlights the things that make you unique. Sharing your mission statement or other value messages is a positive way to distinguish yourself from the competition. Retractable Banner can be an impactful and cost-effective way to do this. Our team of experts can help you select the right banner for your vision. Retractable Banners are an ideal way to project a confident and professional demeanor. They communicate your messages and advertising in a clean, attractive and direct way. Plus, there’s minimal setup time. You can spend more time speaking with your clients and customers and less time fumbling and fussing with your signage. Retractable Banners are travel-friendly and easy to transport! They can be brought along to conferences and events. Lightweight and compact options are available. The experts at Color Reflections Las Vegas can help you select the right Retractable Banner for your needs. Retractable Banner can be used in a wide variety of locations. They are easy to transport from one place to another. This flexibility is ideal for those companies or businesses with a limited signage budget. Color Reflections Las Vegas has options for every budget. We can help you identify and select the right product and material for your project. We dedicate ourselves to the complete satisfaction of our clients. Color Reflections Las Vegas is committed to creating high-quality and long-lasting products. Do you have more than one message you want to share with your customers? Are you looking to change your banner for different promotions? Retractable Banners are ideal for changing designs or messages because the banner can be easily changed out. You’re not limited to one design or message! How Do I Select A Retractable Banner? While all Retractable Banners work very similarly, there are many options when selecting and ordering your banner. Color Reflections Las Vegas can create a custom product to suit your needs. You will want to consider some factors before you design and request your next Retractable Banner. Indoors or outdoors? If you plan on using it outdoors, what weather considerations should you take? However, if you will be using your Retractable Banner inside, you should consider how high the ceilings are and how large your space is. If you Retractable Banner is a part of a trade show booth or display, you will want to ensure your banner is proportional to the other signage elements. If you plan are using your Retractable Banner very frequently, you want to select a material that is more durable and long-lasting. All of the materials Color Reflections uses are durable, but we can help guide you to specific types and materials best for you. If your business or company only plans to use your Retractable Banner once or only on occasions, we can help select a material that is cost-effective for your needs. It’s important to match the materials you choose to the specific needs of your Retractable Banner. What Should I Include On My Retractable Banner? For the best results, Color Reflections Las Vegas recommends focusing on one brand or message. Larger fonts will ensure that everyone can read your message from a distance. We also recommend that you are selecting contrasting colors for your text and background. 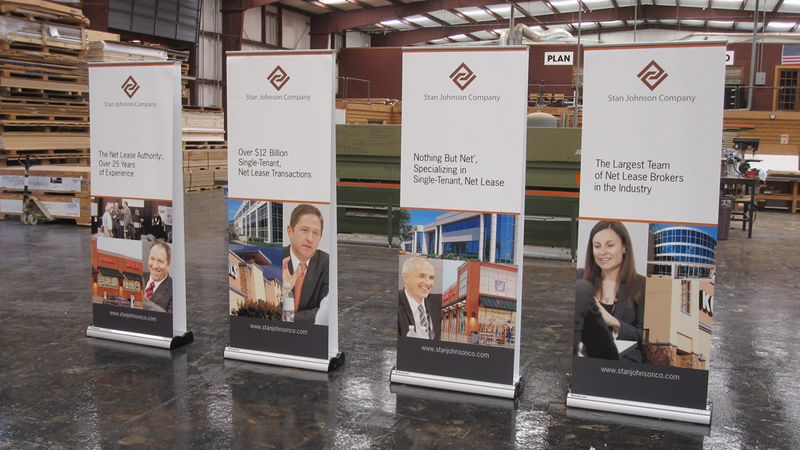 Retractable Banners will help you catch the eye of those walking past. The experts at Color Reflections Las Vegas will provide you with specific measurements for your design. We’ll provide information regarding the correct bleed and safety margins. This attention to detail will ensure that you are fully satisfied with your Retractable Banner. 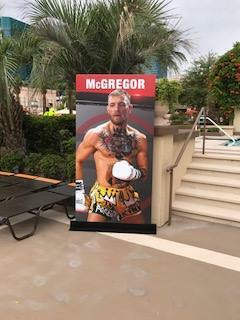 When you are looking to promote your products, services, event or company consider the benefits associated with the use of Retractable Banners from Color Reflections Las Vegas. Their flexibility makes them a perfect choice. Our experts can provide you more information and help you select the right product for your project! Please contact us at (702) 262-9300 or use our RapidQuote™ Contact Form below.